Super Hero Boy: Book Review : I'd really like to eat a child! 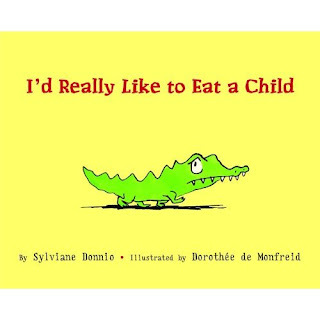 Book Review : I'd really like to eat a child! Heh.. Honestly I requested this book to review as just the title alone got me... I had to think to myself what sort of kids book is that?? Then the little alligator on the front looks so sad.. needless to say I just kept thinking about it and thinking about it till I couldn't stand it any longer. I am SO glad I did request it.. I'd Really Like to Eat a Child is as funny as the title suggests and it wont give your child nightmares I promise. The little alligator, Achilles, in the story is barely bigger than your shoe and he is tired of eating bandanna's every day for dinner. He gets a wild idea that children may just be tastier (Too bad a child could squish him with a shoe!) . He refuses to eat, not even the HUGE cake his parents make for him temps him, and finally Achilles sets off in search of a child for dinner. I won't give away the ending but this little alligator does not get his child for dinner, but he does get a big surprise of his own. Its a great story of growing up and setting goals, even if this goal is eating a child. hehe. Trust me.. its hillarious. I just hate to say more, as I'd really hate to ruin it for you. I'd Like to Eat a Child is available at your local bookstore, or you can order your copy on Amazon!